We are members and active friends of Church of the Reconciler. We continue to serve at Reconciler and give of our time, talents, and resources. Most of us who are listed with a former title are ‘former’ not because we chose to step down or because we were voted out by a charge conference, but because Bishop Willimon and District Superintendent Ron Schultz removed our board, denied us a charge conference, and set up an appointed board that is made up of eight people, only three of which are members of the church. 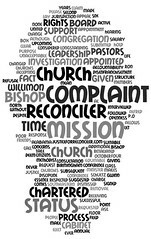 The former leadership was denied a place on the newly appointed board because we signed a letter of complaint about the disenfranchisement of our church members. Yes, please pray! We love our church and all the people who attend and volunteer and give. Thank you Sarah for your time serving meals and may you continue to help us! The only fundraiser we have is the June 28th Banquet so please give and tell your friends! These actions have hurt our church in every way and we need “all hands on deck! !” Go to the church web site for more Banquet information. Again, thank you for all you and your friends have done to help us. I will pray that they do the right thing and save the church. Our hearts have been heavy as we come to serve meals, not knowing why things were falling apart. I am one of the five senior pastors of the last 16 months, having been appointed, at my request, to serve a church where “the real Jesus people are” last June. I came near the beginning of the upheaval that has set this group on an endless quest,despite several rulings by the UMC and despite the clear teachings of Jesus, for some sort of justice. It is clearly not justice they seek – justice meaning a righting of wrong, a resetting of the balance of power. It is vindication. I want to make it clear that Church of the Reconciler is not falling apart, has never “fallen apart”. What has fallen apart is this group’s castle in the air. At no time since April 1, 2011, has there been failure of the biggest open door in Methodism to be opened. Not a meal has been missed. We have never stopped for a moment any ministry of the church. New ministries have begun and blossomed. The church is cleaner, more attractive inside and out. There is far less drug and alcohol activity. No more is divisiveness between the races nor with the UMC connection spoken from the pulpit (not by any pastor, anyway). All of this is owing to the grace of God and the tireless work of hundreds of volunteers and donors, and of a return of gospel-integrity to the pastoral and administrative functioning of the church. If there are difficulties in gaining donors and volunteers, it would be owing to the divisive speech and actions of this group, a few of which remain faithful in volunteering and giving, and most who never have done much of either one. Their words have served to foster fear among the very people for whom Church of the Reconciler strives to be a place of safety for mind, body and spirit. When I came to this church, the administration was a shambles, including finances. Record-keeping was non-existent. Basic policies and procedures to ensure proper checks and balances and to properly distribute power were not being followed. Claims that “things were fine before April 1” are patently untrue. I have said many times that the manner in which changes were made were heavy-handed, but, as has been borne out by the various rulings, all were “legal”. The spokesperson for this group had never cracked the cover on a Book of Discipline until I encouraged her to do so late last summer. But that is all water under the bridge and should have flowed out to sea a long tme ago. The Conference, COTR pastors and staff have not chosen to refute this group’s claims publicly or send letters to every pastor’s and lay delegate’s home criticizing others nor have they attempted to vindicate their own heroes as this group has. Yet, I write this to in some small way say to the public, “Fear not…. 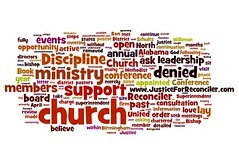 Church of the Reconciler is Christ’s church, is loved and cherished by the North Alabama Conference, and is thriving despite this group’s misguided and violent-to-the-gospel ways.” It is always a tragedy when human energy, particularly within the Church, is used for anything other than building Christ’s kingdom. Justice? Seek first the kingdom of God, and these things will come to you. I pray for my brothers and sisters in Christ, all of them and all of you, that swords will be turned into plowshares, that whether the “justice” you seek is realized or not, that the true treasures of the gospel, the fruit of the Spirit – love, joy, peace, patience, kindness, goodness, fathfulness, gentleness, self-control – will soon prevail and flow from all of us. May the grace of our Lord Jesus Christ be with you all.